Do you ever have those recipes that you've had on your Pinterest board for about five years, that you have full intention of making at some point, but you never actually get around to it? That's how it's been for me and pudding cookies. When I was on the hunt years ago for a good chocolate chip cookie recipe, I had found a recipe that called for a pudding mix, but never got around to making them. Fast forward several years later, and I finally made a cookie recipe that uses a pudding mix! And guess what? They did not disappoint. I made these after school with the kids last night and they were the perfect after school snack. They're the perfect amount of cooked enough so that they aren't super gooey, but soft, dense, sweet, and delicious all at the same time. They're the perfect consistency! 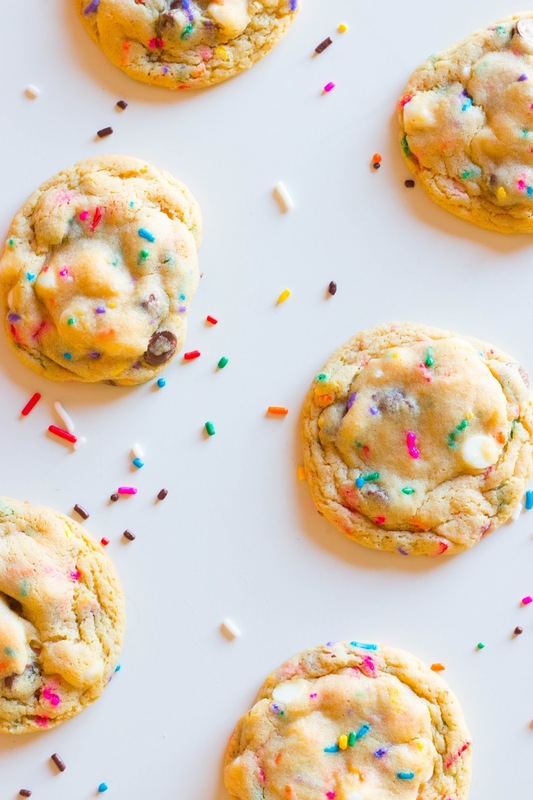 I actually think I might turn this into my new go-to chocolate chip cookie recipe by omitting the sprinkles and white chocolate chips in the future, but that's a recipe to be tested another day! Cream together the butter, sugars, pudding mix, and vegetable oil until well combined. Next beat in your eggs and vanilla. Add your dry ingredients to the mixture (baking soda, salt, and flour). Next fold in your white chocolate chips, milk chocolate chips, and sprinkles. Using a 1 1/2 tbsp cookie scoop, scoop the cookies onto an ungreased cooke sheet, and bake for 8 minutes. Let cookies cool on the pan for a couple minutes before transferring them onto a sheet of wax paper on your counter to finish cooling. Recipe yields about 30 cookies. ooohhh white chocolate is my son's favorite, love that you mix both milk chocolate and white chocolate, magical! Gosh the cookies look yummy. My son is a big fan of rainbow sprinkles and funfetti. It is very ingenious to use pudding mix to make a different dessert, in your case, cookies. They not only look pretty but I bet they taste delicious as well. These look super tasty and so much fun to make with the kids. I love the use of a pudding mix in them, makes them unique and delicious too! These look delicious and I love how colourful they look. I'll have to give them a go! Oh yummy yum yum! These look amazing! I never thought to put pudding in a cookie mix! This looks so delightful and tasty. I just love everything about this!. This would disappear in no time at our house!. These cookies looks so delicious and looks so easy to prepare. I will try to make this for my kids and I am sure they will love this. i never thought of using pudding this way! now I have a new recipe to try! My kids would really love some of these! They are freaks about cookies. These look so yummy- they would be a hit with my kiddos for sure. I bet these would be yummy with chocolate pudding too! These cookies look so pretty and soft! 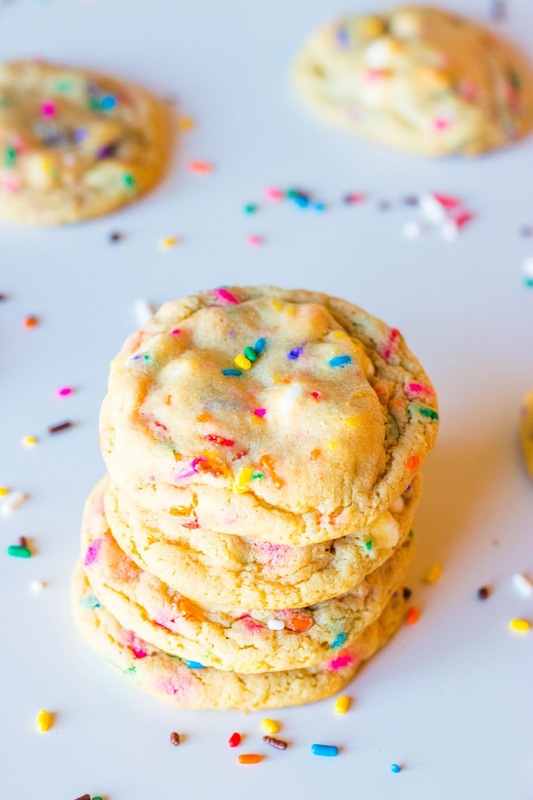 I love the funfetti...a batch of these would brighten any day! Oh these cookies look so good and tasty. I would love some right now. Great idea! Now that is what I call a great way to start the day! It looks delicious! It's amazing! I just randomly found your blog looking for this recipe. Awesome! Good for you! That recipe looks so yummy! I'll have to try that one. Thanks for sharing.